Amy usually is a truly relaxed baby and very easy to look after. Today however, she was far away from her happy and smiley self. At first, I thought that she might be teething but after a while it was quite clear that she must have got up on the wrong side of the cot because whenever daddy held her, he was getting smiles and giggles all around – little monkey. I have taken a little video of her and I will definitely keep it to show her when she is older – always nice to have material for an 18th birthday, isn’t it? For a moment, I was tempted to upload it but Ben talked sense into me. He thinks Amy might get us drunk when we are old and can’t handle our drink any more and make a little home video a la David Hasslehoff. Scary thought, scary thought! Does your little one throw temper tantrums and how do you deal with them? Oh yes my son has full on tantrums. The kind where he forces tears even if it means his face going bright red as well as the usual screaming, kicking, hitting, scratching and the common lay on the floor no matter where we are and just kick and scream until he gets what he wants. However he rarely ever gets what he wants so in Tesco you can usually find me dragging him the way we need to go and him screaming his lungs out. Other than that he's a darling… HA! Mine are not so little now and can still throw a good tantrum! Still waiting to find out when they grow out of them, judging by my eldest I think perhaps they migrate to "moods" as they move into teens! 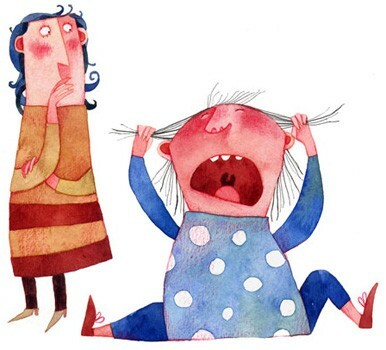 I have a big age gap between my 2 children and my oldest is 20….she still throws tantrums!! Amy must have been having an off day.Feel like throwing a tantrum myself sometimes. my 5 yr old is the queen of tantrums and my 13mth old is following on 2! That picture is amazing, love it! My 28 month old son is really getting into pulling a tantrum at the moment – the one that happened just before he went to bed 30 minutes ago was because his good boy green circle sticker had vanished. You would have thought we had lost his most favourite toy ever. I am really hoping its just a phase and our continued stance on not pandering to him will win the day very soon.